Life abounds in the intertidal area that is revealed during a minus tide. Photo by Ted Mattson. Middy’s tail thumps against the back hatch, expressing the excitement we both feel as I approach the trailhead. My headlights reveal a few other cars in the dirt parking lot - comrades with a similar mission, I surmise. The conditions are perfect this January evening, not too cold, beautiful starry night, and a 7:15 p.m. -4.2 low tide. Fairly extreme for Juneau, the tide won’t be this low again until April. Clad in hip waders and headlamp, I gather up my gear: lantern, gloves, hand rake, bucket, and sport fish license. Middy bounds just ahead on the snowy trail with her bouncy, happy-dog cadence as we make our way through the half-mile of dark woods to the beach. Emerging from the woods, a half-dozen lights dot the dark expanse of beach. I take in a long deep breath and savor the thick scent of intertidal soup; algaes, starfish, anenomies, chitons, limpets, crabs, nudibranchs… hundreds of wondrous organisms exposed for just a few hours. I love this smell. Two people are heading back toward the trail from the beach, “Already filled your bucket?” I asked, trying not to blind the man and teenage girl with my headlamp as they pass. “We’ve been collecting samples for a science project,” declares the familiar looking fellow. As they pass, I realize it’s my son’s ninth grade science teacher. This extreme low tide summons those wanting more than steamers dipped in butter. Scrambling down the beach across barnacled boulders, Middy and I reach the sand and mud flat where walking is easier. We slop our way to a favorite stretch of rocky beach where I once hit the motherload. After finding a spot without too many large rocks, I light the lantern and begin searching for telltale bivalve holes in the gravel. Looking up, I notice Middy sniffing and pawing at a spot a few meters from me. “What’d you find girl?” Amazingly, by accident or intentionally, she found an area thick with clams. Kneeling down, scratching and digging through gravel and sand with my hand rake, I pull one clam after another from the ever-widening hole. Immersed in my own efforts and enjoyment of mingling with eels, worms, urchins and other creatures in my pursuit of clams, I didn’t even notice the approaching figure. “Excuse me, have you come across any juvenal king crab tonight?” I look up and discover Joel Webb, a commercial fisheries biologist who works just down the hall from me in the ADF&G headquarters office. He is out looking for juvenile red king crab to conduct growth and aging studies. Baby crabs are scarce, but the claims are bountiful. I fill my bucket and head back toward the trail when I notice that the light from a clam digger down the beach is very dim. I stop to offer my light. His lantern had broken and his headlamp was quickly losing power. Grateful for the light, he offers me a cold beverage. Hiking back out to the road, we talk about past clamming adventures, clam recipes, and shared what we knew of paralytic shellfish poisoning (PSP) and how to avoid it. Like many in Southeast Alaska, I’ve always been PSP cautious and careful about when to clam (only months with “r”s), what (only Pacific littlenecks, never butter clams or mussels), where (familiar and popular or perceived “safe” beaches). I really enjoy clam digging. Months ago, I decided to write a first hand account expounding on the pleasures of clam digging, along with tips on how to avoid the dangers of PSP. I waited for the right low tide and was pleased with having had a successful and wonderful clamming adventure to share. My clams were happy, as clams are, in a bucket of saltwater in the garage and it was now time to gather information on avoiding PSP. I Googled; read various shellfish reports, accounts and publications; contacted the Alaska Section of Epidemiology and shellfish experts with the Alaska Department of Environmental Conservation (ADEC). I made valiant efforts to find information on how to go clamming safely and also validate my own clam digging passion and pursuits. Despite my desires, all published and scientifically informed avenues led to the same conclusion. DON’T DIG CLAMS ON BEACHES IN ALASKA THAT ARE NOT CLASSIFIED AS SAFE. DANG! There are no classified beaches in Southeast. The first known PSP death along the North Pacific Coast occurred in 1793 when John Carter, a seaman on Captain George Vancouver's expedition, died after eating mussels. In the late 1790s, (1797 or 1799 accounts differ) Aleksandre Baranov of the Russian-American Company logged one of the most tragic PSP reports in history. 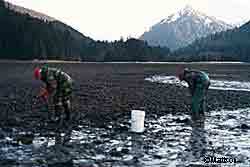 His account describes how Aleut hunters under his command stopped to harvest mussels. Two minutes later, half the party became ill, within two hours nearly 100 were dead. The tragedy occurred near Sitka in a place called Khutznov Strait, renamed Peril Strait to commemorate the horrific event. According to the state’s Epidemiology Section, 189 PSP incidents (many go unreported) have been registered since they began their monitoring efforts in 1976. In most cases, people recover from their PSP experience. 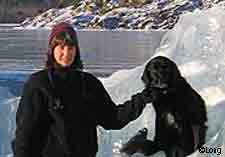 However, mussels and butter clams in the Kodiak area have been responsible for a number of PSP deaths since 1976. The national public health standard considers toxin levels above 80 micrograms per 100 grams of tissue unsafe for consumption. Some clams retain extremely high levels of the toxins for several months – up to two years for butter clams. The frequency of PSP algae blooms spike during the summer months, but can occur at anytime of year. And unfortunately, there is no way for recreational clammers to detect the many types of algae toxins included in the PSP category. The bottom lines is, if you really want to dig your own and not poison yourself, family, and friends, go to the classified beaches and know your clams. Unfortunately, due to the great expense of regular testing, there are only a few recreational clam-digging beaches that the state is able to classify as safe. All are located in the Cook Inlet and Kachemak Bay area: Halibut Cove Lagoon, Jakolof Bay, Kasitsna Bay (McDonald Spit), Tutka Bay, Chugachik Island, Sadie Cove, Polly Creek and Crescent River. There is no antidote for PSP and the toxins are unaffected or diminished by freezing, cooking, steaming, frying, baking, microwaving, etc.. Symptoms usually occur in less than an hour after ingestion and include tingling or numbness in the lips and tongue, often followed by tingling and numbness in the fingertips and toes. These symptoms may progress to loss of muscle coordination, dizziness, weakness, drowsiness, incoherence, and even death. You should induce vomiting at the first sign of symptoms and immediately seek professional medical attention. Not my idea of a good time. Giving up clam digging is disappointing, but Middy and I will find new low tide adventures to enjoy in Southeast Alaska, perhaps working on a science project with students, or helping a biologist find baby king crab. As for the clams we gathered, they are now in the freezer and will be used for crab bait this summer. Nancy Long is ADF&G’s Department Information Officer working in Juneau, a small town where you run into all kinds of people you know on the beach. She grew up digging “safe” clams in the San Juan Islands where she also enjoyed her Grandma’s wonderful chowder, the recipe is available in this month’s issue of Alaska Wildlife News.